Memphis was built around the Mississippi River, and the lure of "Big Muddy," as the swirling brown river is affectionately called, is still the source of much of the city's vitality. 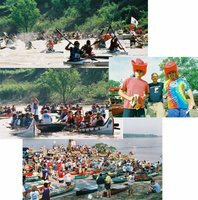 The river's surrounding parks are the site of Memphis' largest celebrations, from the annual Beale Street Music Festival, Memphis in May's World Championship Barbecue Cooking Contest, the Fourth of July Fireworks Extravaganza and more. The river is also a hotspot for budding and expert watersport enthusiasts. 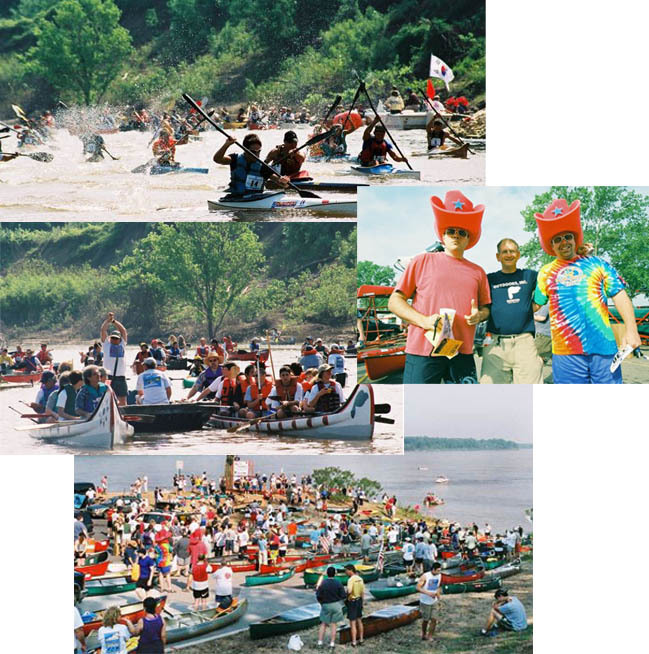 The first stop for anyone looking to enjoy watersports in Memphis should be Outdoors, Inc. Co-owner Joe Royer is the city's undisputed canoe and kayaking expert, and Outdoors, Inc. not only offers equipment rentals and lessons, but also takes individuals or groups on daytrips of varying lengths and difficulty levels. The banks of the river provide as much athletic entertainment as the water itself. Two bridges, the Hernando de Soto and the Memphis Arkansas Memorial Bridge, connect Memphis to Arkansas, while joggers, bikers and rollerbladers enjoy the paved walkways from the south end of Downtown to the Wolf River Harbor. To learn more about Big Muddy's history, visit Mud Island River Park (mudisland.com), accessible from Downtown either by tram or walking bridge. -M.H.R. In a city whose name conjures young Elvis but evokes ancient Egypt, an expedition set out with a road map and some trail mix to find the world’s sixth-largest pyramid, said to have been all but abandoned by the civilization that built it. Legend or fact? With only bottled water and a rental car’s coolness to ward against temperatures in the oppressive low 70s, the team soon despaired. It found houses and churches and rib joints, but no polyhedral structures of note. Then, just when membership in the Explorers Club was about to be risked for some pulled pork and coleslaw, the team noticed a shimmering, triangle-shaped mirage on the western horizon that grew larger upon approach. Holy Moses! 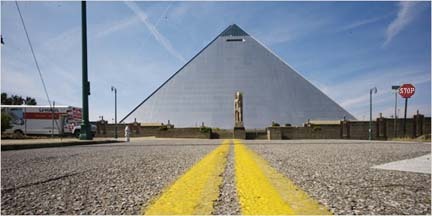 The Great American Pyramid of Memphis. A glorious structure of poured concrete and shiny stainless steel, of form if not function, it rose 321 feet from the sedimentary banks of the Mississippi River, just an ibis’s glide from Interstate 40 and the Hernando de Soto Bridge. Nothing quite like this existed anywhere else on the continent, save the exotic metropolis of Vegas. Forgetting all recent privations and postponing all plans for barbecue, the expedition drove past the empty, glass-encased guard booths; odd, that. It also had no difficulty finding a parking space in an otherwise empty lot. Hmmm. Suddenly realizing the import of its discovery, the most colorful imprecations escaped the team’s collective lips. The Great American Pyramid was empty! Hollow! A pointy-headed tomb without occupant! A quarter-century ago, the idea of a pyramid arose from the city’s desire to provide a larger venue for sporting events and concerts, and to have a structure as defining as the Gateway Arch in St. Louis, 300 miles upriver. Along came Sidney Shlenker, a Denver businessman and visionary, to promote a pyramid of pyramids, one befitting a city named after the ancient Egyptian capital. Mr. Shlenker’s pyramid would be a many-leveled place, with an arena for the Memphis State basketball team, space for glitzy concerts and monster trucks, a Hard Rock Cafe, a hall of fame for music, or college football, or something — and an inclinator leading to an observation deck at the pyramid’s apex, where paying customers could experience that sense of owning as far as one can see. But Memphis has reason for its blues. By the time the $68 million arena opened in November 1991, the city and Shelby County had fired Mr. Shlenker for failing to come up with his share of the project’s cost. The Great American Pyramid of Memphis became, simply, the Pyramid: a place with 150,000 square feet of unused space and a never-assembled inclinator somewhere in its cavernous hold. The Pyramid opened with a farewell concert by The Judds and some flooding in the restrooms. Having altered the Memphis horizon, the jaw-dropping edifice filled everyone with emotion — half with pride, half with anger. Oh, those days. The World Wrestling Federation’s “St. Valentine’s Day Massacre.” The “Bloody on the Muddy” fight between Lennox Lewis and Mike Tyson. Ballerinas and rock stars and Disney on Ice. Within the decade, though, the Pyramid was passé. The Vancouver Grizzlies of the NBA agreed to move to Memphis if the community built it an arena. The team played in the Pyramid for three years, biding its time, until September 2004, when it moved to the new FedEx Forum, a four-minute drive away. You don’t need a burning bush to know what happened next. The Memphis State Tigers and just about everyone else abandoned the Pyramid for the new arena. Not long after, the city created a reuse committee to grapple with one question: What do you do with a 321-foot-high empty pyramid? “We put a package together and sent it to everyone from Six Flags to Disney to people in between to see if there was interest in re-utilizing the facility,” recalls Mr. Kane, who was on the committee. After considering various uses, from an aquarium to a church, the committee finally endorsed a proposal that the Pyramid become — a giant Bass Pro Shop, retail Mecca for all who hunt and fish. A news release in February 2006 announced the company’s plans for a restaurant, a hotel, and perhaps the use of the scoreboard to show outdoor videos. This was only part of the story, the part told by documents that would be dusty were they not virtual. The rest of the story was here “in the field,” as expedition-type people like to say, amid the long shadows of the great but empty Pyramid. The archeological site was ghostly quiet, if one did not heed the buzz of traffic and the ding-ding of a passing trolley. And while there was no trace of the last concert held here — Bob Seger & The Silver Bullet Band, Feb. 3, 2007 — the denizens of this sacred place spoke from the past through the telltale artifacts left behind. Markings on a pillar provided directions to no one for Gate 3. Signs called out about coat checks and restrooms from the dark side of a cobweb-covered glass door. Dangling wires and missing metal railings reflected visits by those who traffic in stolen antiquities. The scoundrels! Seeing the pharaoh, standing sentry before an empty pyramid, summoned to mind a poem by Shelley. How did it go? That is all the team could remember. Exhausted from the thrill of its exciting find, the team got into its rental car, drove across the lone and level asphalt stretching far away, and went in search of some barbecue.